Social Media Managers are a crucial component of a company’s marketing team. With the tremendous power and popularity of social media platforms, business success can skyrocket, or plummet, due to interactions, campaigns, or multiple types of engagements on Facebook, Twitter, Snapchat, Instagram, and other outlets. Overall, a social media manager is in charge of the strategy to promote your brand and visibility online. Equally important — they work to engage with your clients and customers to engender loyalty and propel support of your product and/or services. A cohesive and goal-oriented marketing strategy on social media yields the maximum ROI. It is easy to compose a hashtag-infused tweet or post a funny video on Facebook, but random interaction on platforms isn’t necessarily effective. A social media manager develops and implements a comprehensive and targeted strategy across platforms that tell a connected business story that customers understand, relate to, and that propels them to act. Social media managers execute, or delegate, the day-to-day posts on your channels. This includes assurance of quality images and multimedia, content, quantity of posts, editing, scheduling, and more. From infographics to videos and images to gifs, visual content is at the heart of social media. A successful SM manager will design and create compelling posts in alignment with your brand that strengthens your brand and ultimately sells your products and/or services. Visuals are critical — but what you say matters just as much. Effective copywriters will facilitate consistency in your messaging as you create engagements and conversations with your customers. Social media managers will compose text for posts that not only help customers find you online with keywords and dynamic storytelling, but also to strategically complement your visual content. If you don’t know what’s not working, how can you fix it? A big part of the social media manager’s job is to monitor, analyze, and then adjust your social media strategy as needed to achieve goals of customer engagement and business growth. Using tools such as Google analytics, your SM manager can track overall social media marketing campaign interactions, as well as get very specific information on individual posts. In addition to the above categories, this individual can also have a broader scope in liaising with clients and training junior staff. They also actively seek out healthy relationships with major social influencers online to help stay on top of trends and techniques, and forge valuable business partnerships. 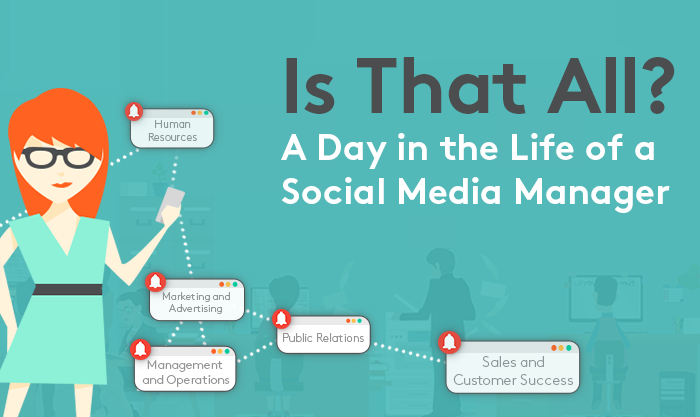 With the ever-increasing usage of social media as a communication portal across many demographics, it is necessary for organizations to be able to harness that potential. Social media managers bring a skill set that serves as a powerful tool that can be a real game-changer for a business. You have to make your customers care — and propel them to share. With a well-developed and targeted social media strategy and quality content that excites and drives your audience to action, you can raise your brand awareness and compete well. A talented social media manager can do just that.